Do you need to create a line sheet? with free custom Line Sheet Templates for your retail and wholesale business. No design expertise required. 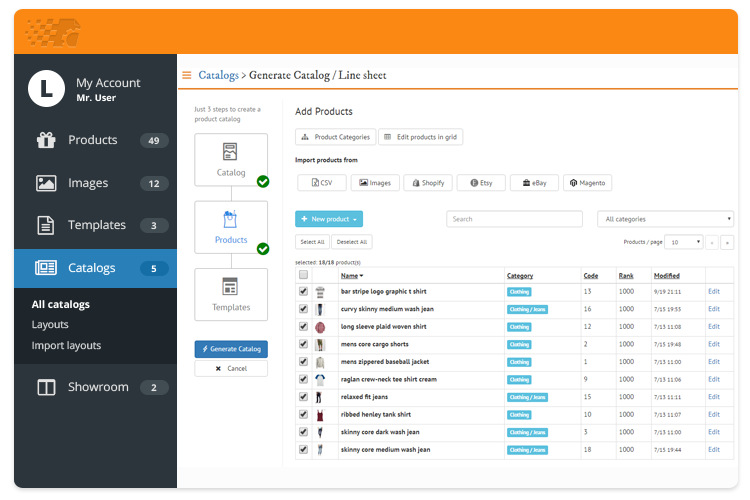 Import products and images from Etsy, Shopify, eBay, Magento, PrestaShop, WooCommerce or CSV with one click and manage your own product database. Create Wholesale, Fashion, Jewelry and other line sheets for your product lines. PDF & mobile-friendly HTML formats. 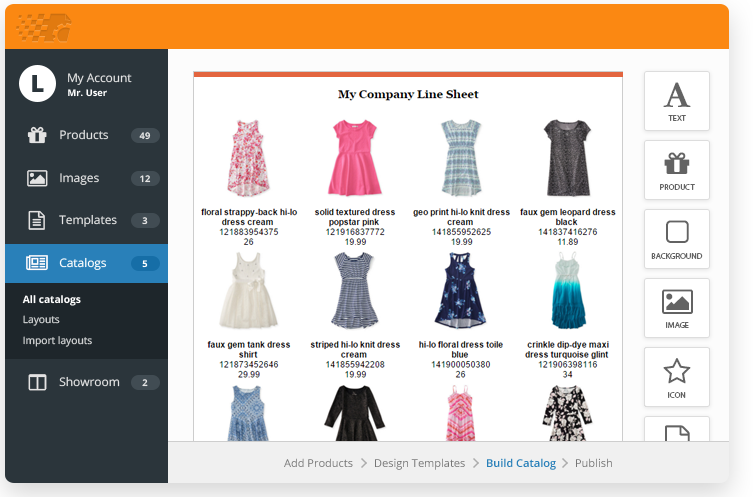 Build customized line sheets with advanced templates for individual markets, customers and events. Share your product line sheets online, social media, send in email or download. Optimized for Google search and Facebook. Embed your Online or PDF line sheet into your website customizing visual options. 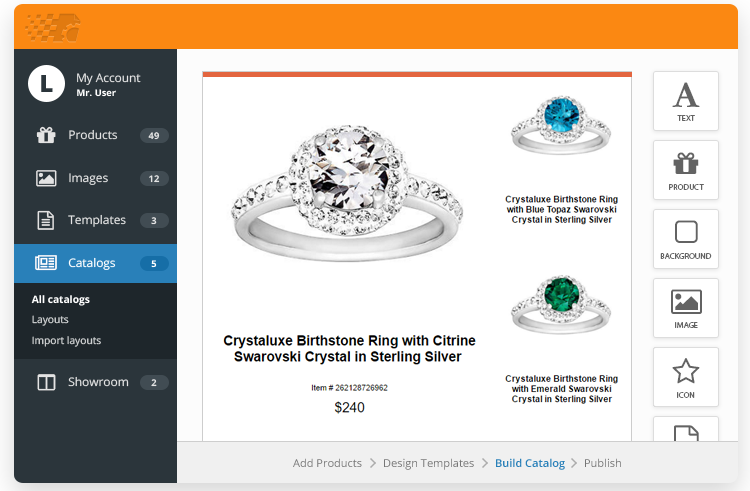 Include pre-built Product Order Form or receive customer order requests directly from a line sheet. Why create a product line sheet? Your business, retail or wholesale customer needs a more technical product brochure or document that gives an overview of your product specifications. You can detail products, prices, materials/options, and order and stock quantities and include your terms and contact information. The key differential between a product catalog is that the line sheet is basic, practical and less marketing rich or lifestyle focused than a product catalog. With the Catalog Machine app you can create a professional line sheet template without investing in a design agency or spending too much of your valuable time. Line Sheet templates can be saved with Catalog Machine, used and shared season or year after year to create and update your new product selection quickly, making creating line sheets an efficient and productive part of your product sales and marketing. Line Sheet templates can also be handy if you need to present alternative line sheet to each customer or groups of customers. 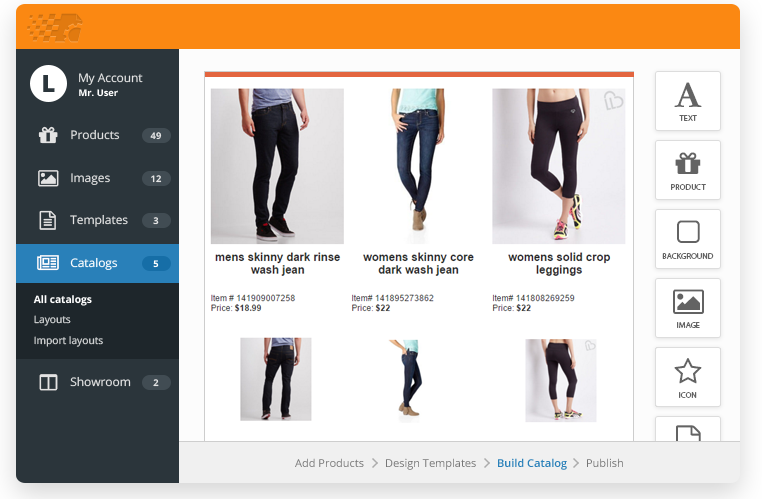 Use the Catalog Machine app to create, edit or import your products and images then quickly add them to your line sheet template. Extend with custom fields / variants / options including images, prices, barcodes, market description, specifications and more. 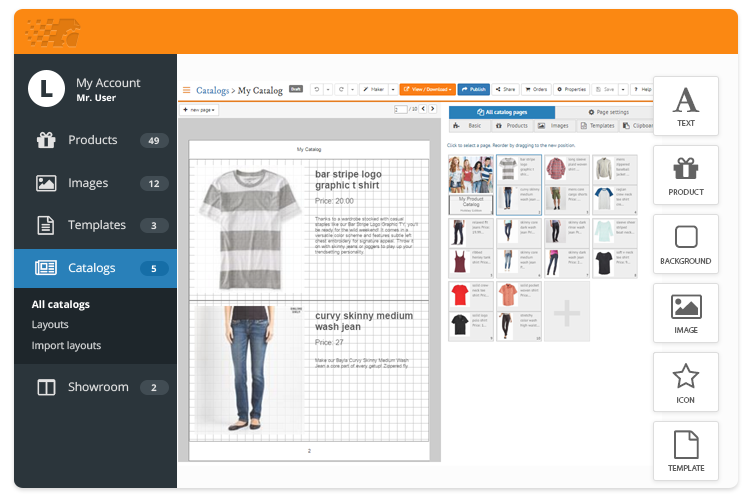 Use line sheet templates and layouts to easily display your product prices, images and description, or create your own catalog design with the flexible product catalog maker. Complete your line sheet by adding custom text, images and marketing material or build your own pages for company, order information or terms of business, product guides, articles and more. 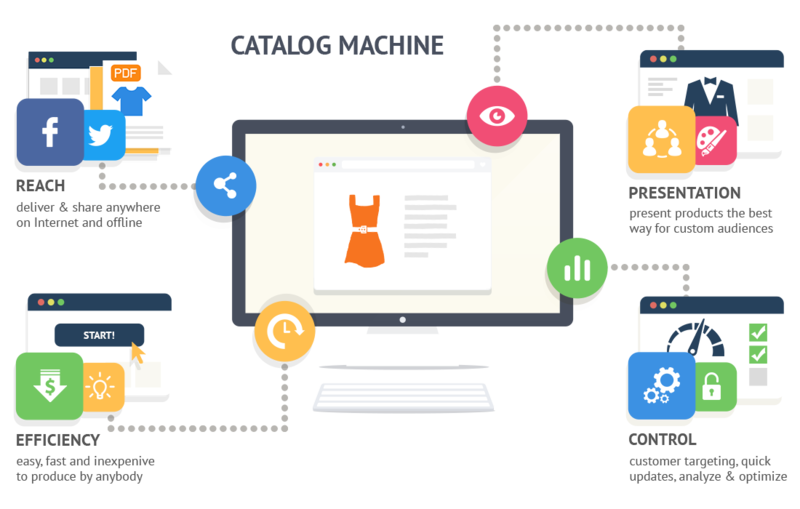 Re-import or change your products in the Catalog Machine database with automatic update in your catalogs. Clone your line sheet versions and set privacy levels up to password protection. Share by email, social media as a line sheet URL, download or send as a PDF, embed to your site quickly and cleanly to make product marketing promotion painless. 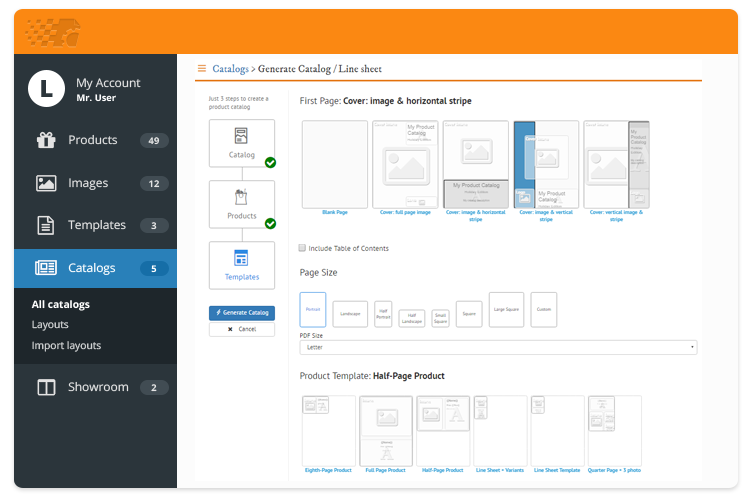 Build your line sheet and update products with your team in multi-user mode. Work as an agency with multiple accounts linked to your login. Line sheet templates often work better with a landscape rather than portrait orientation. Product details can include product name, item number / SKU, wholesale and retail prices, dimensions, key features and options such as material, size or colour variations. Simple line sheet templates should have a simple linear structure and include visually clean product shots (not scene or lifestyle shots) to highlight product's appeal. Fashion line sheet templates may include a cover shot or lifestyle image but products and variations should still be lineally structured. Product line sheets may be for more practical product lines, such as tools, as opposed to high fashion ranges. Again white backgrounds are recommended and list retail and wholesale prices according to your requirements. Merchandising your products in a line sheet template or design, that is, highlighting or featuring some hand-picked or popular sellers with “new” or “bestselling” headlines may help direct sales where they are most desired.